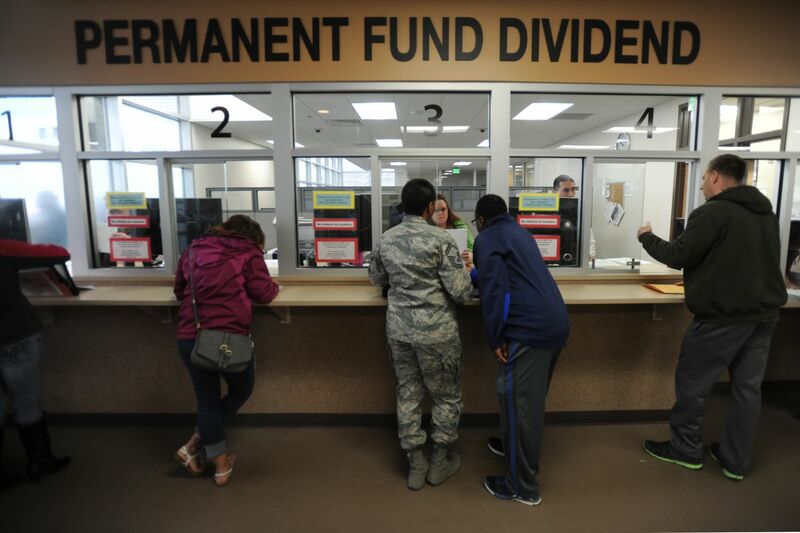 Alaska residents get assistance applying for the Permanent Fund Dividend before the filing deadline on Tuesday, March 31, 2015, at the PFD Anchorage Office in the Linny Pacillo Parking Garage at 7th Avenue and F Street. Alaskans surely must wonder why they should approve shelling out $1 million to link the state's voter registrations to Permanent Fund applications — especially when any qualified Alaskan who wants to register already can. It is an important question in a state saddled with about a $3.2 billion budget deficit; a state that just slashed Permanent Fund dividends by more than half; a state making noises about digging into citizens' pockets to keep the lights on. In the long run, the linkage would cost much more than the initial $1 million outlay. It would cost, Lt. Gov. Byron Mallott says, perhaps $300,000 every year to run and maintain such a system. It is an expensive solution in search of a problem. Alaskans already can register to vote online, by mail or by picking up a form at an elections office, an Alaska Division of Motor Vehicles office, at participating public libraries, or other government offices, the state Division of Elections says. There being no real problem, you have to ask: Why has the campaign to link registrations with dividend applications — a campaign facing scant opposition — received more than $1 million in contributions, many of them from Outside, and who is giving them? Initiative proponents say, in the best nanny state tradition, they only want to relieve us of the "burden" of registering to vote; that it could add 70,000 potential voters to the rolls. You, like me, may wonder why we should spend, potentially, millions on people too uninformed or disinterested to register. They, by the way, have that right. What the initiative backers are not saying is the drive appears aimed simply at advancing the political left's agenda while letting you pick up the tab for boosting voter registrations, especially in rural Alaska where Democrats hold sway. Getting that through the Republican-led Legislature would have been awkward. Instead of hashing it out in those hallowed halls, where it could be vetted, debated, amended, its backers resorted to an initiative, a special interest's best friend. The late Washington Post columnist David Broder, in "Democracy Derailed," pointed out initiatives have become the "favored tool of millionaires and interest groups," to achieve policy aims without a burdensome legislative process. They provide a "lucrative business for a new set of political entrepreneurs," he said, and are "alien to the spirit of the Constitution." The initiative to link PFD applications to voter registration is a prime example. If the measure passes and a qualified person applies for a dividend, he or she automatically would be registered to vote. They would have to opt out if they do not want to be. The linkage would violate your right to be left alone, your right not to register, not to vote, and allows the elections division to add your name to voter lists it sells. It amounts to a government intrusion and an unnecessary waste of time and money. So, who put up more than $1.1 million – just through Oct. 7 – to put the linkage in place? The Alaska Public Offices Commission list of contributors to PFD Voter Registration, which morphed into PFD Automatic Voter Registration, is a Who's Who of Alaska's political left, packed with public employee unions and trade and labor unions of all stripes, Native organizations, and a panoply of left-leaning groups. There is the Washington, D.C.-based New Venture Fund and its whopping $370,000 in cash donations and another $64,000 in nonmonetary management and polling services. National Education Association Alaska-Pace contributed $250,000. The left-leaning Alaska Conservation Voters gave $20,000; the ACLU of Alaska, $10,000; and the list goes on. The initiative has spent more than $1 million, much of it with Washington, D.C.,-based powerhouse media company GMMB, a lead agency for President Barack Obama in 2008 and 2012. It also helped elect former President Bill Clinton along with, it says, dozens of U.S. senators, governors, mayors and representatives. The initiative has spent at least $74,000 with Revolution Messaging, also based in D.C., which calls itself "a full-service digital agency fighting for progressive causes." Locally much of the spending is going to or through political consultant Jim Lottsfeldt, who ran former Sen. Mark Begich's super PAC in his failed re-election bid, and consultant John-Henry Heckendorn, head of Ship Creek Group and a deputy treasurer for the effort. He gift-wrapped the Anchorage Assembly's slide to the left in the last election. To argue the initiative is not about advancing Democrat fortunes at our expense is nonsensical. If the left wants to register voters it should pick up the check and not pass it on to a cash-strapped state while pretending it is for the civic good. We all certainly should vote on Nov. 8 – and vote no on this question. Paul Jenkins is editor of the AnchorageDailyPlanet. com, a division of Porcaro Communications. The views expressed here are the writer's and are not necessarily endorsed by Alaska Dispatch News, which welcomes a broad range of viewpoints. To submit a piece for consideration, emailcommentary@alaskadispatch.com. Send submissions shorter than 200 words to letters@alaskadispatch.com.